Help...everything in our square foot garden is doing well except for Cherokee Purple Heirloom starter from Bonnie Plants (Lowes). The soil is comprised of the standard square foot garden method 1/3 each of peat, coarse vermiculite and 5 types of compost, cumulative. The leaves are curling, are a bit brown on the edges and overall this plant just looks withered. 3 tomato plants in the photo- far left is Black Cherry, center is the Cherokee Purple, and to the right is Sweet 100. Not in picture is Black Beauty Eggplant to the right of Sweet 100. We are zone 9A northeast FL. The garden is in its 6th week of planting. 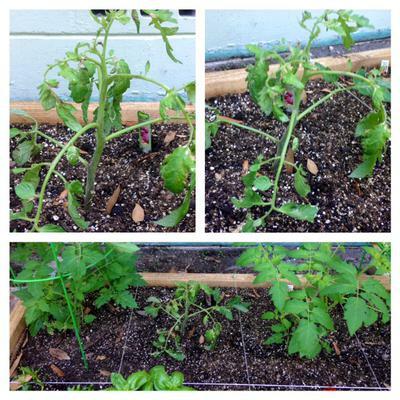 Most were started from seeds, but all 3 tomato plants are starters. Thank you for your time, and any input you can offer. Happy Gardening! I'm having exactly the same type of problem with plants from Lowe's, but plant is described as Bonnie's most popular variety. Pretty sure it's some type of wilt disease. I also frm lowes got a cherokee purple ( bonnie plants ) and a black cherry.. I live in ocala florida. I am experiencing the same exact issue you described. My cherry is doing wonderful and my cherokee looks sad and whithered.